A flyer for the event. Courtesy of the UMDKedma Facebook page. Some students spend their Saturday nights at the bars. Others choose to study or go to the mall. On three Saturday nights this semester, the Orthodox Jews at this university are cozying up to movies at Hillel with fellow community members. As the days grow longer during the spring, Shabbat ends later, and students who observe Shabbat have little time to actually go out to the movies. 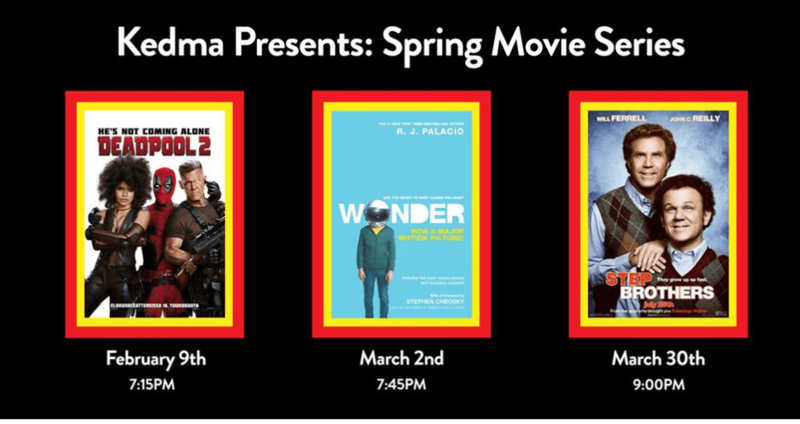 Sophomore architecture major and Kedma Social Chair Liana Chesir created the Spring Movie Series to provide an activity for students as an alternative to partying. “Having a movie shown by us in Hillel creates this kind of nice, easy convenient kind of activity,” Chesir said. Chesir was also inspired by movies at the Stamp Student Union shown by Student Entertainment Events and sought to create a similar experience for Kedma members. “I thought it was really cool of them to have that on campus, so I thought why not have a movie series in our own community?” she said. Each movie is complemented with snacks and shown in the multipurpose room at Hillel. Chesir said the event is “really not difficult” to implement and just requires publicizing through Facebook and simply setting up chairs before showtime. Members decided which movies would be shown by voting in a poll Chesir created in the Kedma Facebook group. But not everyone agreed with the results. “People should be able to do whatever they want by themselves, but for a community to be promoting an R-rated movie, I don’t know if that was the best idea,” said Meisler. Although freshman public policy major Shlomit Menashe thought Deadpool 2 was “violent,” she is overall happy about the variety of movies shown. Menashe also went to see the second movie in the series, Wonder, on Mar. 2. “I cried the whole time, and I think every single person in the room was crying as well,” Menashe said. Step Brothers, another R-rated movie, is set to air this Saturday night. Although Meisler has never seen the film, he thinks it’s “probably not the best idea.” Other students look forward to the movie and don’t see the rating as a problem. “The Saturday night movies are a nice way for the community to come together and chill in a relaxed environment,” Menashe said. Chesir is happy about the success of the series so far and plans to continue it in the future, potentially expanding to Thursday and Sunday nights. “It’s really nice to have an activity within the community that they actually choose, so I think this is definitely something that can be continued through the coming semesters and coming years,” said Chesir. No Replies to "Students sprung by Kedma spring movie series"